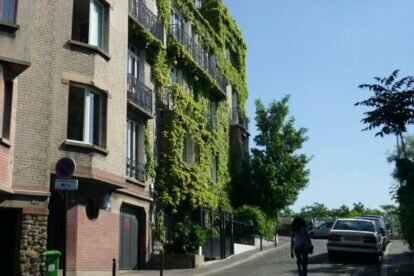 As you may know if you read my articles about La Campagne à Paris (check the La Campagne à Paris article) or Les Villas de la Mouzaïa (check the Les Villas de la Mouzaïa article), I really like picturesque and bucolic areas in Paris, generally surrounded by modern buildings, but which look like a village or a suburban residential neighbourhood. That’s why I want to help you discover the Butte Bergeyre, one of the least famous of these areas, built on the site of a former (and ephemeral) football stadium. The architecture of the buildings is not as uniform as in the previously mentioned sectors, but there’s still a good harmony between buildings and green, and there’s even a nice collective garden taken care of by the inhabitants of the area. Last but not least, your efforts to climb the stairs will be rewarded by one of the best views on Montmartre and the Sacré Coeur, but don’t count on me to show you a picture, you’d better go there!